You and your location manager need to know the location of the shutoff valves for all fixtures and appliances, as well as the main shutoff valve for the house. View our Emergency Plumbing Procedures to better equip you and manager on duty the knowledge of how to handle a plumbing emergency. If the problem is not with a particular fixture or appliance, or if there's no shutoff valve for the fixture or appliance, use the main shutoff valve to turn off the water supply to the entire building. 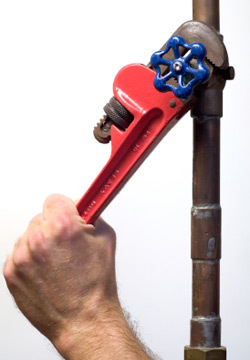 You'll find the main shutoff valve on the inside or outside of your building where the main water supply pipe enters. Professional Tip: If you need a wrench to turn the valve, keep a specially labeled one near the valve so it's handy. If the main shutoff valve itself is defective and needs to be repaired, call your water company; they can send someone out with the tool that's required to shut off the water at the street before it reaches the valve. Veterans will make temporary repairs to stop the leak and secure the building. Let the faucets run until cold water flows from them (this indicates the water in the heater is no longer overheated). Close them. Call Veterans to make any necessary repairs to the heater's thermostat and pressure relief valve. DON'T use a chemical drain cleaner if the fixture is totally blocked. Drain cleaners will only help a slow draining sink.